Our first choice was closed for remodeling so we ended up at the Spicy Thai and were very glad we did. We were visiting our daughter who lives in Lancaster and had never eaten at this spot so it made for a new experience. The menu is extensive, the food very fresh and flavorful and you are able to dial in the level of "spicy" that suits your taste which met our requirements perfectly. Made for a perfect family dining experience and we'll recommend this highly. My family and I visited Spicy Thai Restaurant in Lancaster CA. We ordered the seafood soup, red curry with shrimp, red curry with chicken, and shrimp tempura. I have had curry in many places but Spicy Thai is among the best. I recommend this place. 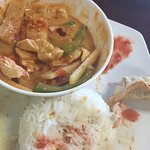 I was first referred by a co-worker and I have to say that Spicy Thai has the best Thai food I've had in a long time. That was a few months back and I've been hooked ever since. Their food is tasty, not greasy and the portions are very satisfying. I've tried the soups, appetizers, lunch menu items and entrees. They have spicy from a 1 to a 5 so you choose how spicy your taste buds can handle. While I've never sat down to eat in the restaurant, I've gone to pick-up and have even had food delivered to my office on a couple of occasions. Their prices are good so if you're looking for good, authentic Thai food I highly recommend Spicy Thai. Spicy Thai is a small restaurant but they served very good Thai food. Lunch special run around $7.99 and have many choices. The portion is also good. If you like your food spicy you can name your spicy level 1 thru 5. Service is always great here. Lunch special come with soup, main course, salad, 2 fried dumpling and choice of white rice, brown rice or fried rice. If you happen to be in Lancaster area one should go here and try out their food. 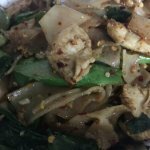 Been to Spicy Thai Restaurant? Share your experiences!